I’ve seen a lot of bags of leaves (and whatever else accumulates on lawns) out on the curb in the last couple of days. Now that winter’s over it’s time to make your property pleasant to look at! Unfortunately bags of leaves don’t interest me whatsoever. I have made a few finds, however. 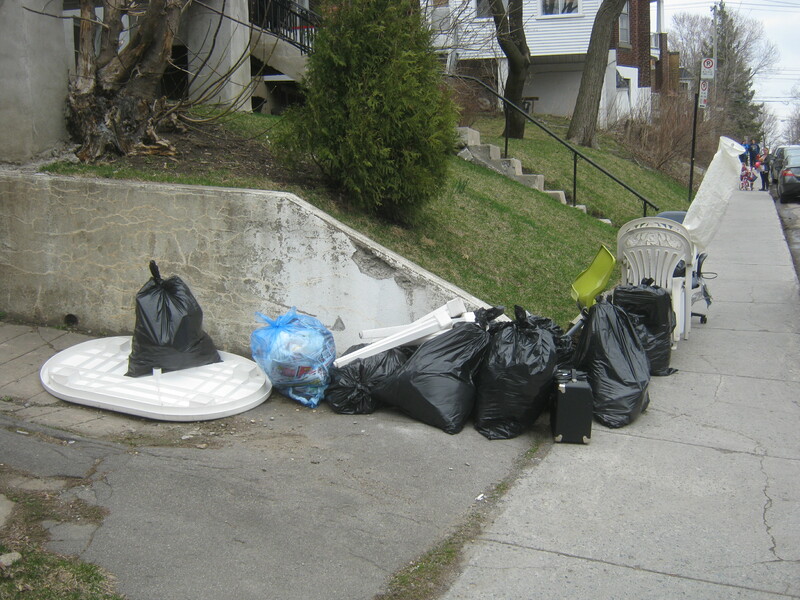 I’m driving a lot for a job and I spotted this pile in Westmount close to Decarie (possibly on avenue NDG) on Friday. In the front you can see a little guitar amplifier that was amongst the stuff. I brought it home and it works well other than an annoying buzzing noise. This should be easily fixable though – I gave it to my room-mate for her to work on. Yesterday I found the body of an electric guitar sitting on top of a bunch of bags on St-Dominique near Gauthier. It’s in decent shape – just empty. The same room-mate is interested in it as a project so I gave it to her to do as she pleases! 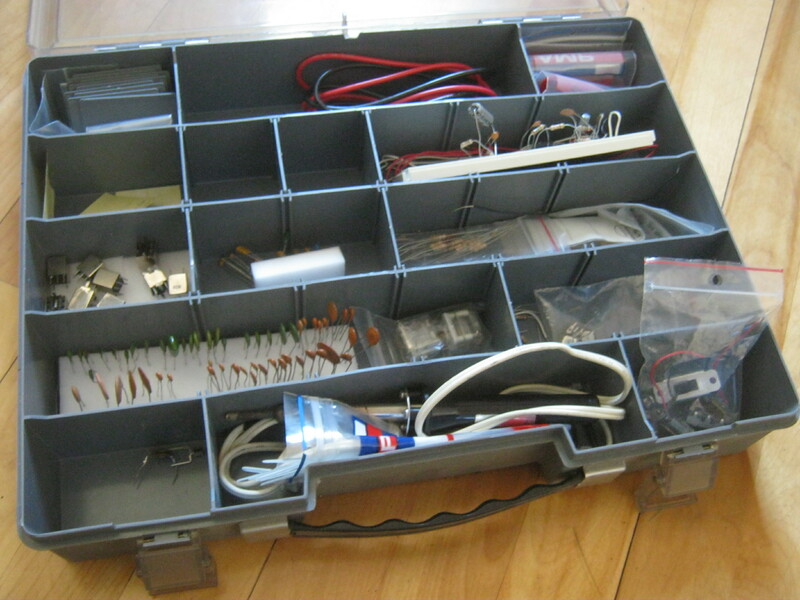 Inside one of the bags with the guitar was a box with a bunch of electronic-type stuff inside. It should come in handy in the guitar project. I have no idea how this stuff works, but maybe I’ll learn a thing or two from watching. 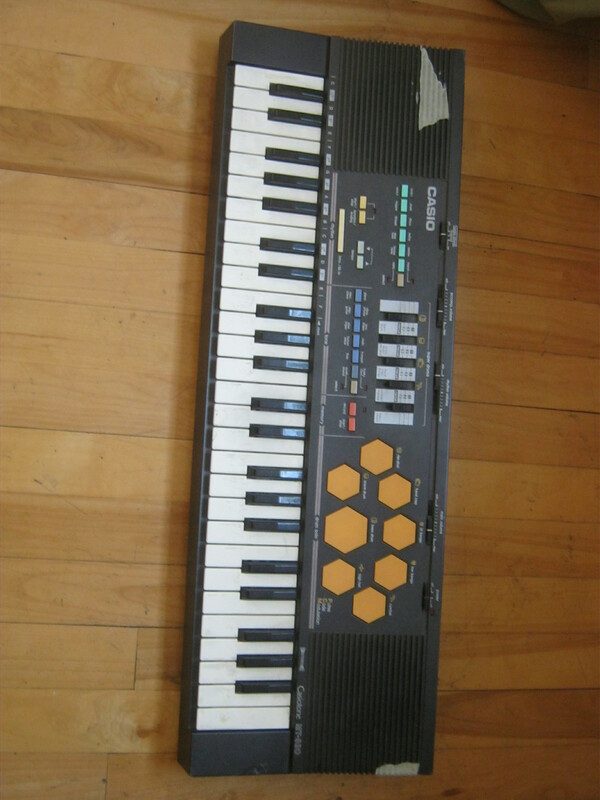 Also on top of the pile of bags was this keyboard. It looks to be in decent shape but I didn’t find the adaptor so I can’t test it. It’s just a matter of time until I find another 9v DC adaptor, and once I do I’ll let you know if it works. I’m fairly busy with work but I should be able to make my evening runs at least. Soon the garbage will start flowing from the McGill ghetto as some of the kids leave a lot of stuff behind when they move back home for the summer. It was pretty crazy last year and I’m not expecting anything different this time around. Make sure the adapter has the right polarity. I always grab ac adapters when I see them (usually tangled in a ball, complete with misc cables), because invariably something turns up that needs them. The bigger the collection, the more likely to have a match. But even then, you end up searching for a specific adapter for something found. The parts look generic mostly, but some IF transformers and variable capacitors for radio building. It leaves me wondering why those parts, wondering if there was more in other bags or another day. The white thing with components stuck in holes is a breadboard, for putting together parts without soldering. Useful for trying circuits out. 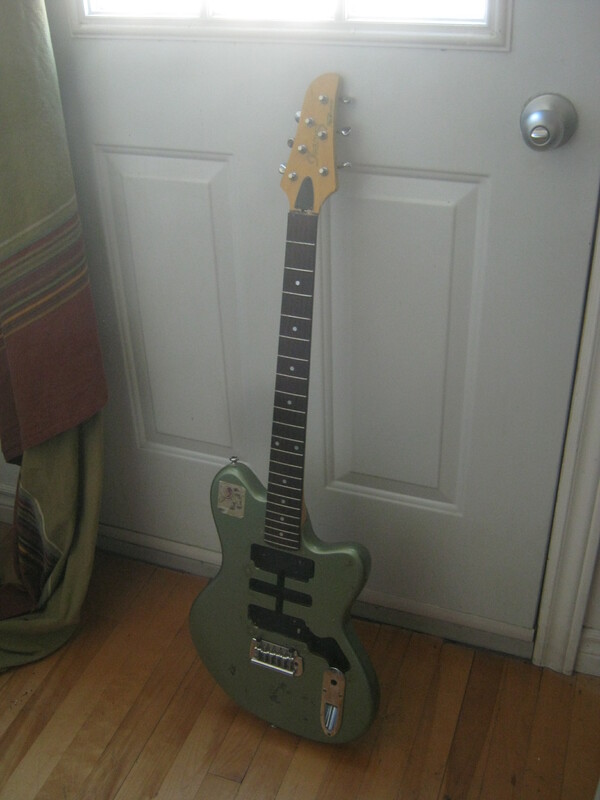 Great find of guitar amplifier you made in Westmount/NDG.I can tell by the photo of the street you posted that it is an upscale neighborhood.It seems more wealthy than the Plateau for sure.Please do Westmount/NDG more often. 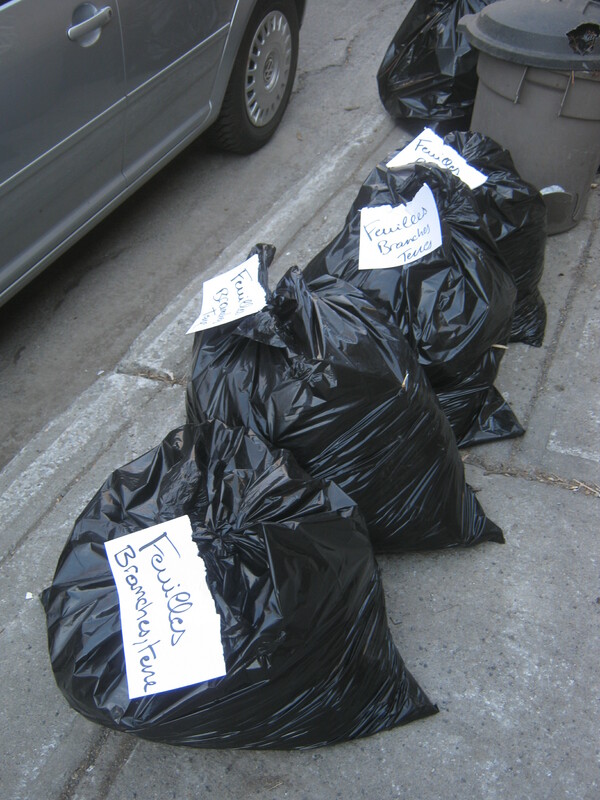 Most residents of Westmount would not do much dumpster-diving openly because they think they are rich and do not need to.So people like you and others should do their part.You might find analogue music in the garbage in summer–remember to rescue discarded vinyl records and audio music cassettes.Both have become popular again. I love your blog;I live in Montreal but also travel around in the US for weeks at a time and live there occasionally.I agree with your premise-we must reduce excessive manufacturing and excessive buying at the root.If I have a good antique drawer I inherited from a grandmother.I intend to keep it in my Montreal home till I die.I do not want to replace it or buy a new drawer.I do not buy new furniture until it is very compelling.One of my friends has a coffee table more than 15 years old and 50 year-old mahogany bookcases in solid condition.He never wants to buy new furniture either.A lot of people throw out drawers/commodes on the street that could easily be repaired.What a waste of wood!And I hate rampant styrofoam use in many US states and in some Montreal restos.As for bottle collectors and can collectors,I have admiration for them.I have walked on Plateau and downtown streets and seen many,many broken beer bottles on the pavements.So don’t assume everything thrown will be picked up and salvaged by scavengers.Not only do you need to continue scavenging,but one needs to raise awareness about these issues as you are doing.Keep it up.Did you get your bike fixed? Thanks for the good words! I still have to fix my bike but am too busy to do so at the moment. It sort of fixed itself but I can only use the one gear.